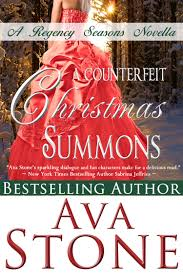 A Counterfeit Christmas Summons by Ava Stone is a 2013 Night Shift publishing regency novella. I picked this one up a week or so ago for free in the kindle store. Emma has been in love with Viscount Heathfield most of her life. Heath is a close friend of her brother Drew. But, Drew hasn't been inclined to concern himself with Emma's love life, so she takes matters into her own hands by inviting Heath to visit Drew. The catch is she makes the letter look as though Drew was the one doing the inviting. Drew isn't even at the castle and knows nothing about any letter. Heath is mystified when he receives a summons to visit Drew. The tone of the letter and the language didn't sound like Drew. But, he decides to make the journey and bring along a companion. Upon arrival at the castle, Heath begins putting two and two together. I enjoyed this light hearted regency romance. A comedy of mix ups and misunderstandings bring two people together who were meant to be. The only complaint for me was that it was just too short, making things feels a little too rushed. I often feel that way with novellas and short stories so it may just be me. I still enjoyed the book and recommend it for a holiday read to those that enjoy historical romances. This is a really fun read!